Wind is the only climatic load acting on every single type of structure in the entire world, different from other loads like snow, for example. The wind size depends on the geographical location of the structure. That is one of the main reasons why today’s standards have regional division (wind zones) and consideration of altitude, as well as variation of dynamic pressure depending on the height above ground for a ‘normal’ site, without masking effect. The effects of wind surround structures, causing forces on walls and sometimes entering buildings if openings exist. 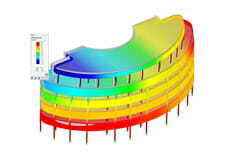 Complex architecture of buildings and the requirements from standards for wind make the determination of wind loads one of the main challenges for structural engineers. The harmonisation of standards in Europe made EC 1 the current standard in many European countries. Eurocode 1 lays down the rules and calculation methods for wind action on buildings under 200 m of height. EN 1991‑1‑4  also specifies rules for common chimneys, lattice towers and bridges (road bridges, craneways, and walkways). Contrary to other Eurocodes, each country has its own National Annex for EC 1, in which wind zones and other ratios are specified. Each wall of a building is exposed to wind on its two faces (internal and external face). Wind pressure on the building is either dampened or amplified depending on the size of the surface the wind is applied to, its openings, and the type of impact on the faces (overpressure or depression). For every construction, external and internal pressure must be determined. As many buildings are assumed closed, the internal pressure of wind may be negligible. Internal pressure coefficient cpi depends on the size and layout of the openings in the building. Here we are talking about permanent openings (such as gaps, chimney ducts, etc.). If at least on two faces of a building (façade or roofing), the total area of openings on each face represent 30% or more of the total area of the face, rules defined in 7.3 and 7.4 of EC 1 must be applied. The internal pressure coefficient can be determined in a few steps (see Figure 01). Its opening area is inferior to two times the opening areas of the other faces. Conclusion: When e ≥ d (depth of the building is d = 10 m), there is no C zone. If h/d ≤ 0.25 or h/d < 1.0, cpi is read on the corresponding curve for each wind and opening configuration. If 0.25 > h/d > 1.0, cpi is obtained by linear interpolation between the two curves for each configuration. In most cases (for common buildings), without precise knowledge of the openings distribution, the standard recommends using extreme values cpi = +0.2 (overpressure) and cpi = 0.3 (underpressure). With the wind load generator in RFEM, you can specify the value of cpi after having it determined. The entered data is then considered for the automatic creation of loads.